Facebook says it mislabeled this advertisement from a health insurance company as political. 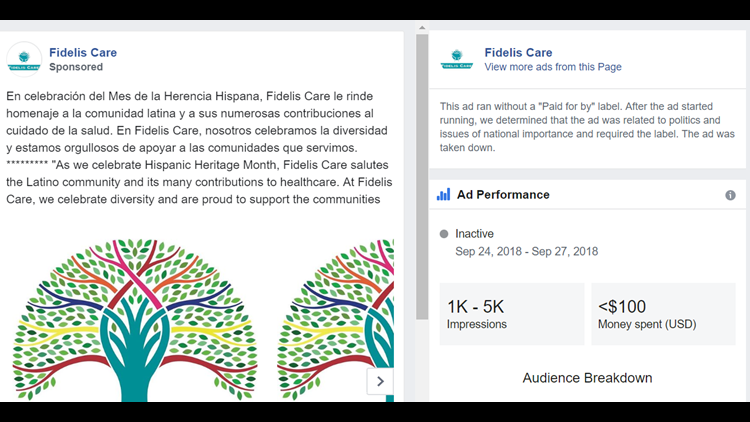 SAN FRANCISCO – A Facebook advertisement celebrating Hispanic Heritage Month from a health insurance company. A professional women's club showcasing black dolls so children can see "beautiful reflections of themselves." Prostate cancer screenings for African-American men in Colorado and cervical cancer screenings for Hispanic women in Ohio. A pledge in Spanish for fast loan pre-approval from a mortgage company. Dozens of advertisements removed from Facebook for being political ahead of the November midterm elections did not appear to express any political view, a USA TODAY analysis showed. The Facebook ads from businesses, universities, nonprofits and other organizations did seem to have something in common: They mentioned "African-American," "Latino," "Hispanic," "Mexican," "women," "LGBT" or were written in Spanish. Even offers of free delivery from Chipotle Mexican Grill were mislabeled as political until an inquiry from USA TODAY. Laurie Schalow, the restaurant chain's chief communications officer, said Facebook "corrected the error" after being alerted. 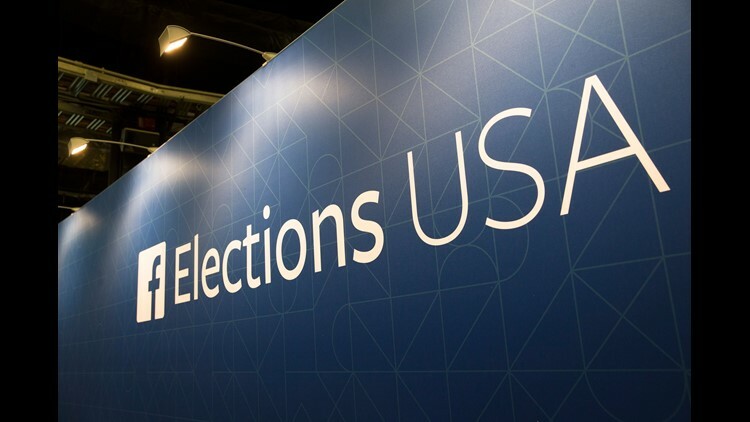 Facing a flood of criticism over its failure to stop foreign interference during the 2016 presidential election, Facebook this year adopted stricter advertising disclosures for political campaigns and for contentious national issues. In addition to deploying artificial intelligence to sift through ads, Facebook said it would add thousands more moderators to manually review the text, images and targeting of ads and it would create an online archive of political ads. The changes were intended to give Facebook users a window into how political advertisers seek to sway voters on social media and to help stop meddling from shadowy organizations such as Russia’s Internet Research Agency. Investigations by USA TODAY found that the Russian social media campaigns with the aim of amplifying political discord during the 2016 presidential election overwhelmingly focused on what is arguably America’s rawest political division – race – and sought to inflame Hispanic tensions over immigration after President Donald Trump was elected. Now complaints are piling up that Facebook is miscategorizing ads as political when they are not, highlighting the enormous challenge of sifting through millions of ads. Flagging ads that mention race and identity point to the tense climate that has thrust Facebook into the uneasy role of arbiter of political discourse. Many of the ads USA TODAY found were inadvertently flagged by either humans or machines, Facebook said. But these mislabeled ads represent a small slice of the more than 1 million political ads on the platform, Rob Leathern, director of product management at Facebook, said in an interview. "At the scale that we are doing this, there are going to be mistakes," Leathern said. "We rely on a combination of machines and humans. Sometimes machines make mistakes. Sometimes humans make mistakes. Sometimes both." He declined to provide USA TODAY with the guidelines moderators are given to decide which ads are political in nature, saying the company does not share precise criteria to thwart bad actors. "We find that there are people who try to game the system if we provide detailed guidelines of how we review things," he said. "We want transparency wherever possible but, when it comes to some of the enforcement mechanisms, we also have to anticipate a cat and mouse game with very sophisticated adversaries." Under the new rules, advertisers who want to buy Facebook political ads in the United States must register as political advertisers and prove who they are and that they live in the country. Any ad that Facebook says is political in nature or touches on a broad list of issues of national importance such as education, abortion, the economy, poverty and taxes – including ads that have been rejected as political after they began running – are taken down and placed in a publicly available online archive maintained by Facebook. Among them is an ad placed by Alpha Kappa Alpha Sorority, a Greek organization for African-American college women, for 3D mammograms to promote breast cancer awareness in Houston. It was removed after being categorized as political for advocating for women's health, falling under health care as an issue of national importance, according to Facebook. Facebook says this ad for Rosa, a foster child searching for a home is political because she mentions being a defender of LGBTQ+ rights. Melissa Kindall buys a Facebook ad every week on "Waiting Child Wednesday" in hopes of finding homes for older kids in Pennsylvania who are close to being discharged from foster care and forced to fend for themselves. 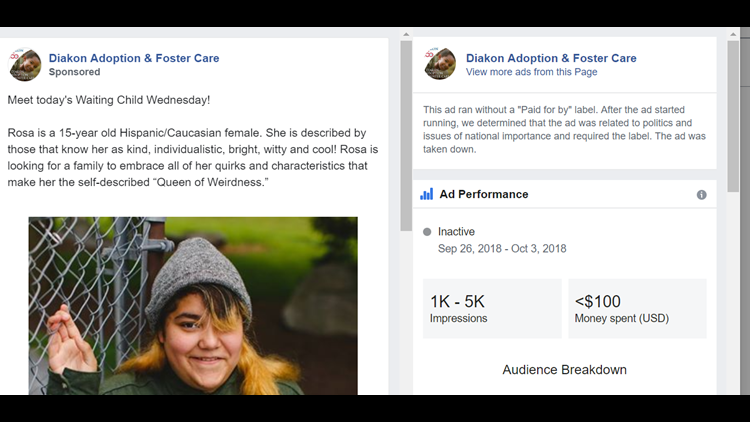 Kindall, manager of social media and digital communications for church-affiliated nonprofit Diakon Adoption & Foster Care, was surprised when the ad about 15-year-old Rosa that she placed in September was taken down and placed in Facebook's political ad database. None of her ads had been removed before. The Facebook ad described Rosa as an animal lover, a computer-savvy artist, writer and illustrator who dreams of a career in animation and is a "defender of LGBTQ+ rights." After it was viewed 6,000 times, Facebook blocked the ad. In her opinion, nothing in this ad was political or polarizing, Kindall said. Facebook told USA TODAY that the foster child's LGBTQ "advocacy" is an example of an ad about civil rights, which it categorizes as an issue of national importance. 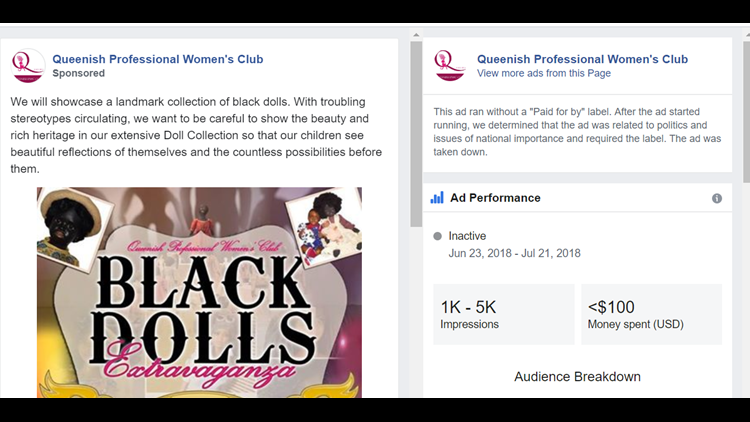 Facebook says it miscategorized this advertisement for a collection of black dolls as political. This isn't the first time that Facebook has been criticized by news organizations and other groups and businesses for being overly aggressive in defining what's political. The Menlo Park, California company says "false positives" – ads mistakenly labeled as political – can be found in all categories from the environment to health care. That includes a recent Reebok ad promoting a sports bra that was rejected by Facebook and more than two dozen Nike ads that mostly featured pictures and videos of sneakers, AdAge found. In June, a Walmart ad was removed because it mentioned "bringing jobs back to the U.S." Facebook reversed that decision. Advertisers who mention LGBT themes in their ads told The Washington Post earlier this month they were unfairly targeted by Facebook. Tom Garguilo, who operates a Facebook page on the historic gay bar the Stonewall Inn in New York City, told the newspaper that so many of his ads were blocked that he has stopped using words such as "LGBT" or "gay." "I’m hoping it will get enough attention to make Facebook change their behavior toward LGBT content," Garguilo told USA TODAY, "to stop suppressing it." Blocking gay-themed ads or ads along racial or ethnic lines raises troubling issues, said Chad Williams, professor of history and African and Afro-American Studies at Brandeis University in Massachusetts. His department’s job posting for a professor of black feminism and queer studies was rejected as political by Facebook. 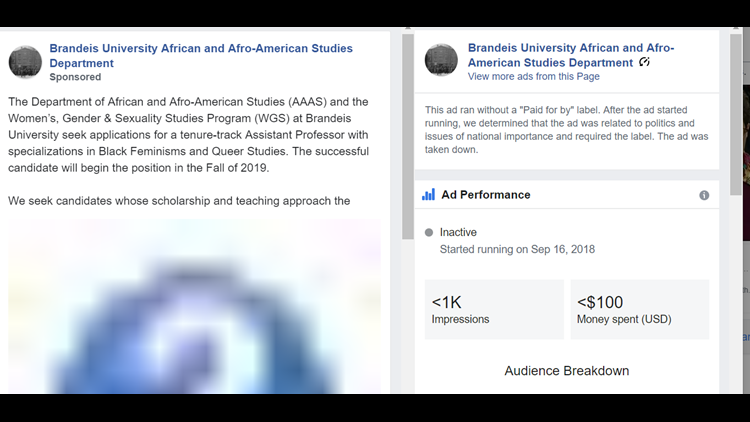 Another ad placed by the Brandeis University Alumni Association highlighting its first black graduate was also blocked. 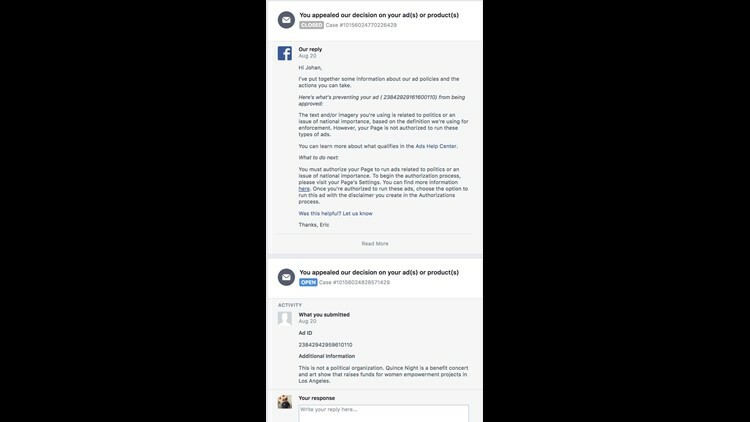 Facebook reviewed both ads at USA TODAY's request and found they were removed in error. Facebook says it mislabeled this ad for a job opening at Brandeis University as political. "There is certainly nothing inflammatory or intentionally divisive about sharing our job post on Facebook. We are not trying to start a race war. We are just trying to get somebody hired," Williams said. "To explicitly associate African-American or any type of racial term or appellation with being political with the obvious insinuation of being politically divisive is deeply troubling." Facebook has made a fortune helping advertisers quickly and easily reach the people most likely to want to see their messages, with that advertising business generating nearly $40 billion in revenue last year. Brands, small businesses and political campaigns turn to the advertising platform for its ability to precisely target audiences with such details as location, interests and political leanings. Less than 5 percent of Facebook's ad revenue comes from political ads. The company considered banning them altogether months ago. Instead, it put in place safeguards aimed at preventing foreign election interference and other nefarious activities. Those safeguards have come at a price. Complaints are growing that ads for political campaigns or from political advocacy groups slip through without any political label while other ads that are not political get hung up. In a Democratic primary race earlier this year in California’s 4th Congressional District, advocacy group Sierra Nevada Revolution ran negative ads against a candidate. Facebook did not flag the ads as political. More: Russia exploited race divisions on Facebook. More black staffers, diversity could have have helped. Advertisers contacted by USA TODAY say they received no clear explanation from Facebook for why their ads were rejected and, despite an appeals process, had little recourse. They object to registering their organizations as political as they say that would be a misrepresentation of their business or mission. And some staffers of these organizations, who are charged with buying social media ads, say they were leery of sending off their driver's license and other personal information to register as a political advertiser with Facebook. The organizers of Quince Night say their event attendance suffered after they were unable to run ads on Facebook. They appealed Facebook's decision that they were running a political ad twice. Johan Moreno, one of the organizers of Quince Night, a Quinceañera-themed benefit concert series in Los Angeles that raises money for four local nonprofit groups, says he tried to run Facebook ads a week before the event but they were rejected. He twice appealed Facebook’s decision with no luck. He didn’t have time to register as a political advertiser and said he shouldn’t have to. "Quince Night is organized by two people who just want to make a difference in the community and support causes and people we genuinely care about," Moreno said. "We were really upset with the decision. I personally believe it impacted our attendance." At USA TODAY's request, Facebook reviewed the ad in question. The company says it was correctly marked as political because it was raising funds for and awareness of "women empowerment projects."